Philip Roth's latest novel, Nemesis (London: Jonathan Cape, 2010). It’s been over a week already, but I still don’t get it. 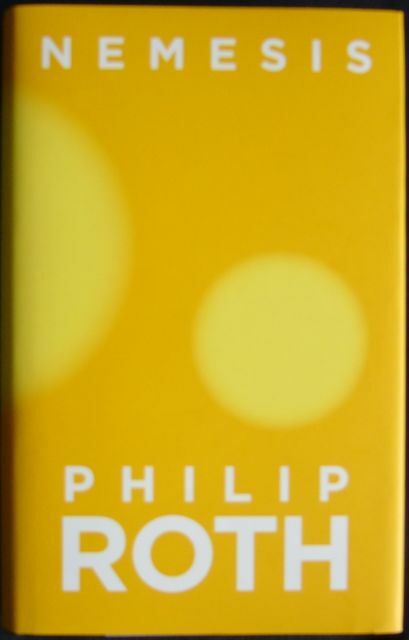 One minute it is announced that Philip Roth has won the Man Booker International Prize for 2011. The next minute we learn that one of only three judges, Carmen Callil, has stepped down because, in a nutshell, she basically doesn’t think Roth deserves the award. Fair enough, but why stand down after the prize has been announced? And what was the chair, Rick Gekoski, doing during this time? Why didn’t he react sooner? I don’t understand. And what I find irritating is that the whole event ultimately has little or nothing to do with Roth’s work. Roth certainly doesn’t need the award: I presume he needs neither the publicity nor the money. So I googled the various parties involved to see who might most be in need of some publicity. I think the results speak for themselves: “Carmen Callil” yields 136,000 results; “Virago Press” (the publishing house Callil founded in the seventies) gets 176,000 results; “Man Booker International Prize” totals 489,000 results; but the champion of them all is “Philip Roth”, with no less than 2,760,000 results. While I was at it, I of course gave in to the temptation to google “thisissuperserious”. Here, too, the results speak for themselves: 49. Looks like I’m going to have to work on my own PR. This entry was posted in Philip Roth and tagged Man Booker International Prize, Philip Roth. Bookmark the permalink. Please go ahead !! You have a terrific sense of humor. A Robert Benchley style ! !